Sometimes it is the simplest zombie that gives you the most terror. This Standing Robed Zombie Woman is not bloody or covered in gore from her last meal. However, she is a realistic zombie that will send chills down your spine. This female zombie has all the gruesome detailing that one would expect out of a classically inspired horror zombie. Her face and skin is colored a sickly color of gray that gives her a dead, near-decaying look, which is only enhanced by the way that her skin is sunken and stretched across the bones of her skull and her hands. Her face is locked in a blank, unfeeling expression, while her blue eyes are milky and cloudy, devoid of anything that was once human. Long strands of black hair frame her undead face, while a tattered brown and black robe covers her frame. This decoration is composed of molded plastic hands and a head, while the rest of the body is pose-able armature, which allows this zombie to be put into any position you deem appropriate. It is easy to assemble and makes a great indoor or outdoor prop. Of course, a stand is included to keep the zombie woman upright when in use. 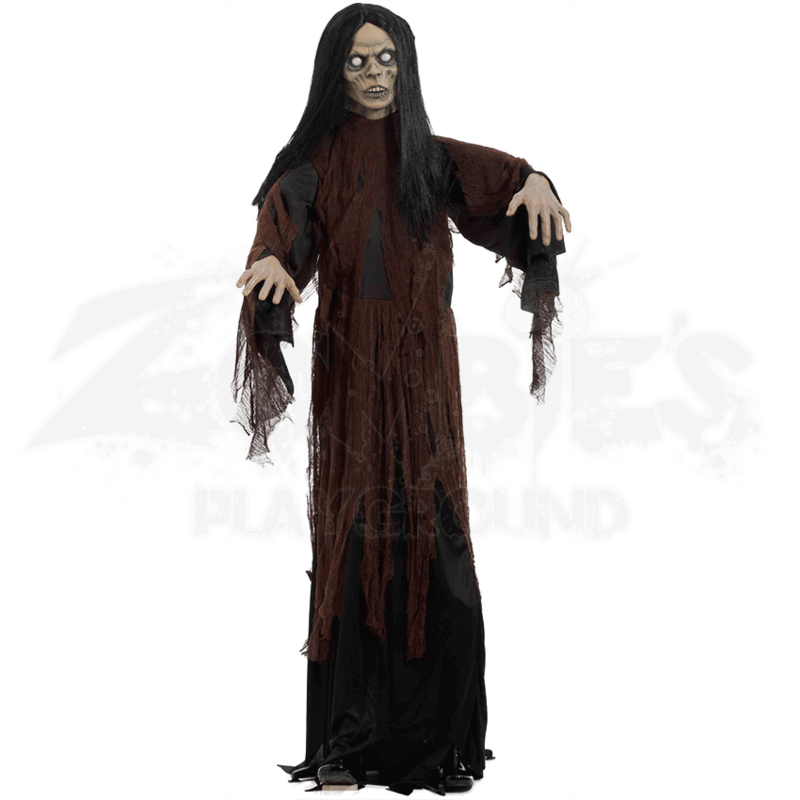 This zombie female stands at an overall height of 72 inches (6 feet) when fully assembled. 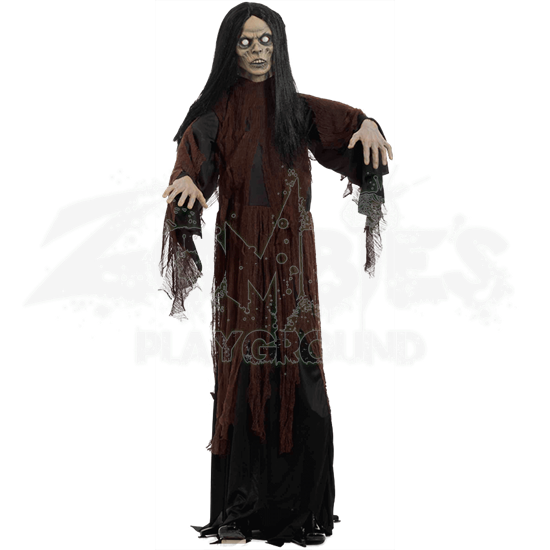 Of course, if you are looking for a few dead men and women to stand in while you assemble your own zombie apocalypse, the Standing Robed Zombie Woman will suit your needs perfectly, Or, you can always dress her up however you want and let her stand in as a scary decoration whenever Halloween comes around, too!